Roger Ebert, word aversion, and a Pinterest for dudes: The week's most interesting Slate stories. Roger Ebert died this week at age 70. 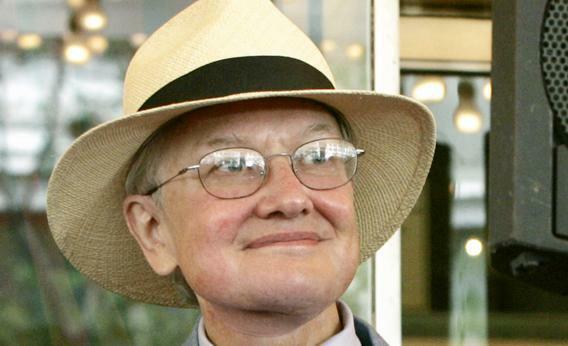 “Roger Ebert: Mentor, prolific sharer of links, cooking philosopher, and lover of the movies,” by Dana Stevens. Slate’s film critic remembers the influential life and career of the legendary Roger Ebert, who died Thursday. Celebrating his boundless curiosity and energy, Stevens also acknowledges the role Ebert played in inspiring her to follow in his professional footsteps. “Pinterest for Dudes: Is it sexist to create a visual sharing site for men?” by Seth Stevenson. Given that the audience for photo-sharing website Pinterest is 70 percent female has led to a spate of new photo-sharing sites geared toward men. Is that sexist? Or more analogous to magazines like GQ and Marie Claire, which also have gender-specific target audiences? “Why Do We Hate Certain Words? : The curious phenomenon of word aversion,” by Matthew J.X. Malady. Why are so many of us repulsed by words like moist or crevice? Malady explains the concept of word aversion, discussing theories as to its possible causes and its relative prevalence across professional writers, bilingual speakers, and other groups. “The Basketball Bully: Rutgers coach Mike Rice helps draw the line between acting like a jerk and abusing your players,” by Emily Bazelon. In light of Rutgers’ recent firing of Mike Rice, Bazelon examines the prevalence of domineering coaches in sports. While studies show that a dictatorial style can be a legitimate coaching strategy, she argues that this does not excuse outright violence and cruelty. “Thesis Hatement: Getting a literature Ph.D. will turn you into an emotional trainwreck, not a professor,” by Rebecca Schuman. Schuman is convinced that pursuing a PhD in literature was a colossal mistake. Graduate school may offer intellectual rewards, she concedes, but the monetary compensation from a stable position at a decent university is a guaranteed zero. “I Like It, but I Don’t Like It Like It: The Facebook phone is not as dumb as I thought it was going to be,” by Farhad Manjoo. Manjoo tells us what the new Facebook Home is not: a phone, an operating system, or an app. Installing Facebook Home ultimately means transforming your phone’s lock and home screen into a new Facebook interface that offers a feed of photos and updates from your friends. Considering that Facebook accounts for almost a quarter of the time that people spend on their smartphone, Facebook Home is happy to facilitate the addiction. “The Week I Had HIV: Misdiagnoses are a rare but intractable problem. Here’s what happened to me,” by Mark Joseph Stern. Stern recounts the week in which he was misdiagnosed with HIV, asking how such a highly sensitive test could malfunction or be misinterpreted. He also reflects on the emotional toll of the misdiagnosis and the succession of realizations that hit him over the course of one terrible week. “Let the Race Begin! Why silly speculation about the 2016 presidential race can do some real good,” by John Dickerson. Dickerson takes an ahead-of-schedule peek at the 2016 Presidential race. The Republican Party, with front-running prospects Marco Rubio and Rand Paul, is fired up with a risk-taking energy as the party reforms itself and seeks a new direction. In the Democratic field, Hillary Clinton is in a class well above the rest. “The WHO vs. the Tea Doctor: For once, an herbal remedy actually works. Why are malaria experts against it?” by Brendan Borrell. An herbal tea is being administered to people in Uganda and across Africa as a prevention and treatment of malaria. Despite evidence of the teas effectiveness, though, experts worry that its unregulated use could cause the malaria parasite to develop resistance to anti-malarial drugs. “The Real Problem With Law Schools: They train too many lawyers,” by Eric Posner. The scarcity of entry-level jobs in the legal profession and the ever-growing burden of student debt present a real crisis for new lawyers. Posner criticizes proposed solutions to the problem, including greater debt-forgiveness and shortening law school to two years, arguing that these responses would only increase demand for legal education at a time when the job market simply cannot support the quantity of lawyers looking for work.